These double-prong hook can be used to organize garden tools, workshops and garages. For hanging tools to pegboard. Complete your Gladiator. Wall System with GearWall. Base Board. Install some between your GearWall. Panels and the garage floor or use it as a decorative trim around doors, windows, and more. With multiple application possibilities, Gladiator. GearWall. Base Board is a great way to bring a finished look to your garage. Slotwall is a wall panel system used for merchandise display and storage. Panels are constructed of 3/4 inch medium density fibreboard (MDF) and are available in a variety of finishes. Each Slotwall panel contains routed grooves, spaced every 3 inches for placement of Slotwall accessories. The Kubota 2pc Large Plastic Hook Set is the perfect storage solution. Features quality plastic and durable self-adhesive backing. Easy to apply, just peel and stick. Ideal for organizing and decorating. 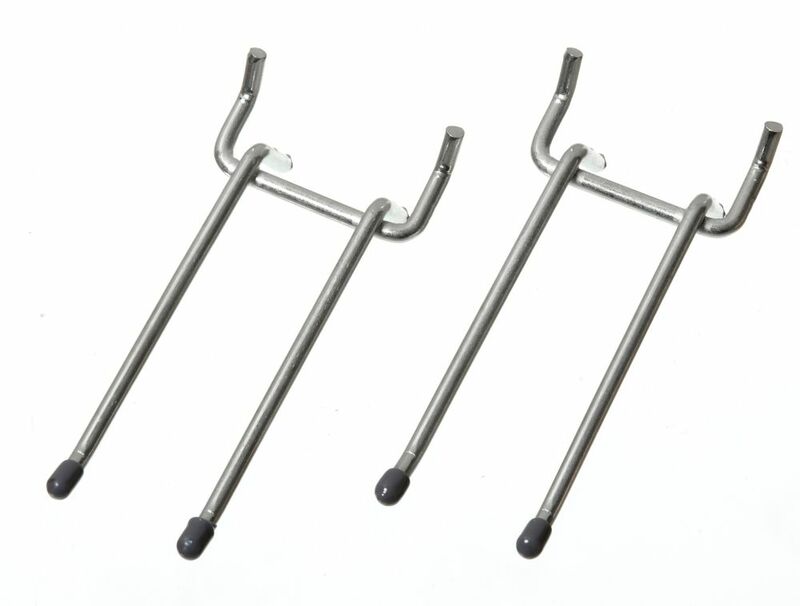 4 Inch Double Arm Hooks These double-prong hook can be used to organize garden tools, workshops and garages.